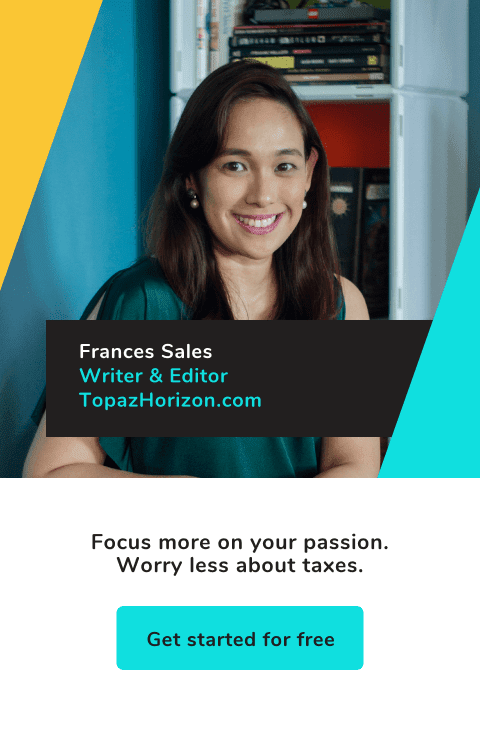 TOPAZ HORIZON: Mariel becomes a wife! 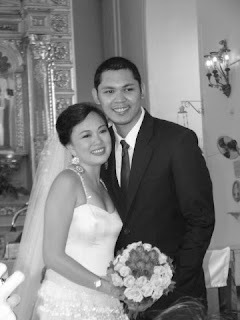 My dearest darling friend Mariel Chua just became Mrs. Alvin Jimenez over the weekend in a beautiful wedding at Cebu. Ohhhh, it was such a lovely wedding! Perfect for two of the nicest people on earth. I'm matron of honor! Mariel chose a sunny yellow for me to match my personality. 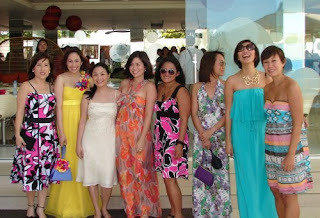 Of course, our friend Kate Torralba did the gowns. I'm wearing purple shoes under this gown but I forgot to take photos of it! Vince and me! He was supposed to wear a tie with the suit but it was really really hot! I look so pregnant, don't I? With the Summit girls. Most of them don't work with magazines anymore, however, all nearly gone to their next adventures. The cathedral was huge! Huge! 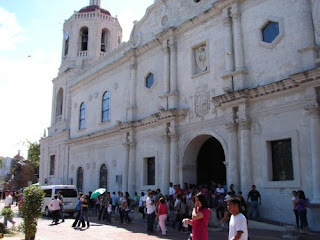 It's really rather beautiful inside but the pics we got didn't do the church any justice. When we finally buy a new camera, we'd take more photos. Here comes the bride! In a creamy tiered lace confection. That skirt is fully beaded and is layers of different kinds of lace. 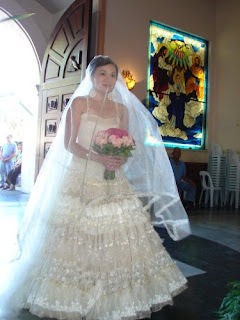 Mariel, you look divine! The ceremony had us laughing and crying. Very romantic. But I have no photos! At the beach reception, the newlyweds cuddle. 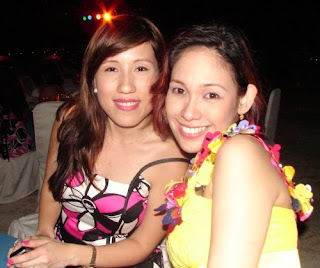 Ianne Evangelista and me. She used to be the editor-in-chief of Cosmo and she gave that up to get pregnant and have a baby girl. After meeting her little Claudia--the smartest 2-year-old girl in the world--I totally understand! Aside from making the gowns, Kate also sang a few songs. 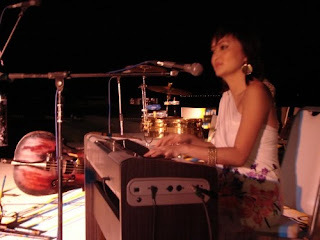 She is amazing at the piano, by the way, with a deep melodious voice. This girl can sing better than she can sew, and that's saying a lot about her musical talent! 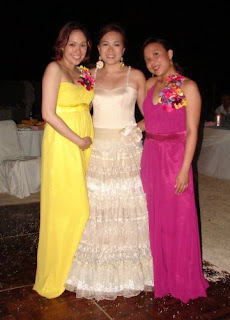 Me and Kate with the bride. I'm holding my tummy because I ate too much and it felt really heavy. This photo is a variation of the photo from my wedding (click here for that pic)! That's Kai, the maid of honor. Kai's Mariel's best friend since they were little kids. She's just as nice and smart as Mariel. 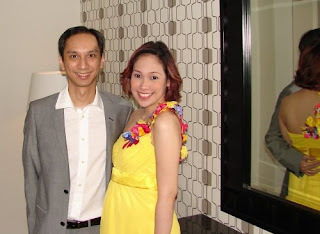 Mariel and Alvin, congratulations! May all the happiness in the world bless your marriage. Vince and I are so happy for you--such a great adventure ahead! Your friend's gown is so dreamy! You're one gorgeous pregnant lady, Frances. Looking forward to the pics you'll post as your baby bump grows bigger. hehehe you look so gorgeous! A bit pregnant! Not TOO pregnant! 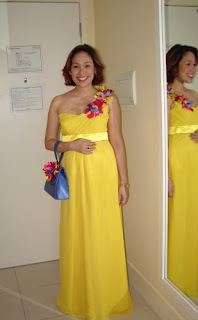 :) the yellow dress suits you and your smile radiates ! :) Congratulations to the newlyweds!